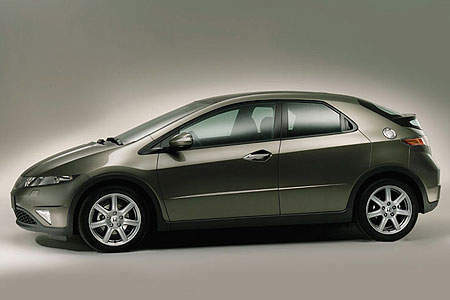 Here it is, the 2006 Honda Civic. It kind of reminds me of the Scion TC which is Toyota’s marque targetted at young buyers. The base model will come with a new 1.8 SOHC i-VTEC motor which will replace the aging 1.7 SOHC VTEC currently found in base model Civics here. The new i-VTEC SOHC motor will make 140PS@6300rpm of power and 174Nm@4300rpm of torque. Looking at the performance stats, it’s pretty much a lazy engine unlike the venerable B-series. Lazy engines which do not rev high and have massive torque at low RPMs are good for city driving fuel economy, a factor which is taken into consideration by alot of buyers these days because of the rocketing oil prices. During highway cruising the engine is said to be have the economy of a 1.5 litre engine. The side profile looks extremely sleek and very modern. 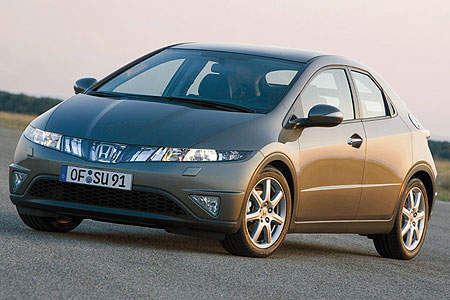 When Honda unveiled the Euro Civic concept and said it would be the base for the next Civic, they were not kidding! The car follows Honda’s new flat rectangular headlamp and integrated grille scheme, unlike it’s previous triangular curvy headlamps like the one in the Civic EK. This new look is in Malaysia in the form of the Accord and the Oddysey. Hidden rear door handles like the Alfa 147. Looks better this way :) Notice the strange ‘dual’ rear windscreen design? I wonder whatever for. Kills the whole smooth flow of the design. I think the back looks good but I do find the way the design of the number plate holder a bit strange. I think they made it too deep, making the back of the car lose the smooth lines everywhere else on the car. Check out those twin triangular tailpipes! You also can have a closer look at the two different windscreens here. Looks like the rear view visibility is killed. Nice driver oriented interior with a single huge RPM meter in the middle of the meter panel, flanked by water temp and fuel gauge meters. I assume the digital number above is the speedometer. 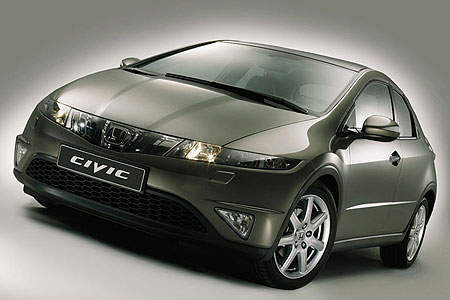 These images seem to be the Civic Si hatchback version. 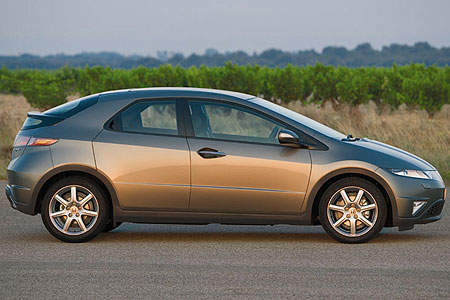 Honda also has sedan and coupe versions of the Civic. You can check out spyshots at The Car Connection and Temple of VTEC. 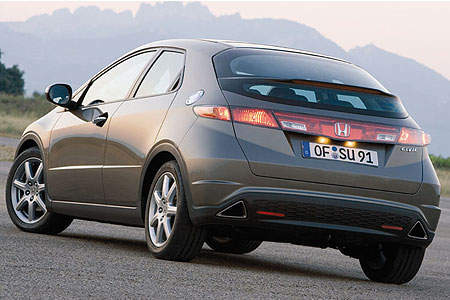 British auto show Fifth Gear has reviewed the 2006 Honda Civic hatchback.